Current accounts are the most reviewed product on Smart Money People, which is no surprise given the millions of people who have them. The market for these accounts is incredibly competitive, but thanks to our community of reviewers we can go some way towards helping you choose the one that will work for you. How did we produce this chart? The chart comes from the insight we’ve had from the thousands of reviewers who tell us what they think about their financial products – good or bad! 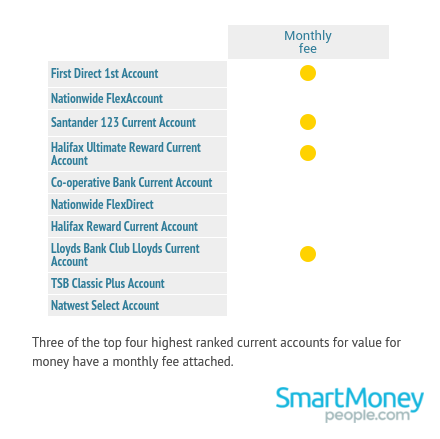 In this instance, our best current account chart highlights the best current accounts and ranks them in order of most recommended, value for money, customer service, and how each reviewer has rated their overall current account experience (out of 5). Value for money: how do free accounts compare to those with a monthly fee? For many people, a current account is the most important banking product, and you’ll want to make sure that the one you choose works best for you. Most of the main high street banks offer accounts with a monthly fee attached, and they offer a range of perks in order to try and get your business, for example: mobile phone insurance, cashback deals on household bills, and services such as text messages when you’re about to go overdrawn. Having this account is incredibly valuable to a bank: once they have it, and access to your spending habits and personal data, they’re able to better understand customers and offer suitable products, which hopefully you pick. Free current accounts don’t make banks any money, but can often lead to you having more products with them. Our reviewers tell us that three of the top five current accounts for value for money have a monthly fee attached (some don't charge this fee if you satisfy certain conditions - see below), showing that while the free accounts may be appealing because of the lack of a fee, you might not necessarily be happier without the extra perks and benefits that paid accounts receive. The First Direct 1st Account is consistently our highest rated current account – they also won our inaugural British Bank Awards in February 2015 – and their value or money rating of 4.7 out of 5 is proving hard for others to beat. Although Santander’s 123 Current Account is currently ranked third in the value for money stakes, they have recently announced that their monthly fee is increasing in January 2016 which may impact their strong value for money showing in our charts – something one reviewer has already highlighted, and we wonder how many complaints Santander have received because of this bait-and-switch. Regarding fees, it’s worth noting that sometimes you might not necessarily have to pay anything each month if you satisfy the individual bank’s terms and conditions. With First Direct, for example, they state that you will not be charged their £10 a month fee “for the first six months from account opening, when you pay in at least £1,000 to your 1st Account each month, or maintain an average monthly 1st Account balance of £1,000, or you hold a selected First Direct additional product”. As Jack points out in the comments below, most of the bank's customers will satisfy these conditions. The most up-to-date data for current account switching shows that Santander and Halifax attracted the most new customers during the last six months of 2014. But how happy are the customers who moved? By filtering our reviews by people who have switched and those who haven’t, we can see that those who have changed their current account are happier overall with their new provider. The average overall score for those who have switched accounts recently is 4.69, with non-switchers giving their account a 4.12 overall score, proving that the grass can actually be greener on the other side. Halifax’s Reward Current Account has proven particularly popular with our switchers – 19% of our switching reviews have recently moved to this current account, with 29% of consumers nationwide choosing the bank. Their overall score from switchers is a very impressive 4.91 out of 5. Switchers to Santander’s 123 Current Account are only slightly less happy overall with their new accounts, with an average score of 4.86 out of 5. Our figures reflect the trend towards these banks as 28% of our switchers have set up new accounts with Santander, which is roughly the same as the national figure of 26%. So which bank offers the best current account? First Direct’s 1st Account tops every single one of our leaderboards. Nationwide’s FlexAccount deserves a mention too as it ranks second across all of our tables, as well as having the added benefit of having no monthly fee attached. Do you agree? Tell us about your current account! Your reviews can determine who comes out on top when we take another look at this list next year. Had a great customer experience? Or do you feel like your bank could do better? Head over to our review page and let us know how you feel about your current account today.